For the dramatized athletic spectacle, see Professional wrestling. "Wrestler" and "Wrestlers" redirect here. For other uses, see The Wrestler. For other uses, see Wrestling (disambiguation). Wrestling represents one of the oldest forms of combat. The origins of wrestling go back 15,000 years through cave drawings. Babylonian and Egyptian reliefs show wrestlers using most of the holds known in the present-day sport. Literary references to it occur as early as the Old Testament and the ancient Indian Vedas. 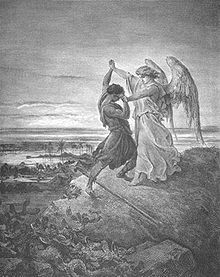 In the Book of Genesis, the Patriarch Jacob is said to have wrestled with God or an angel. The Iliad, in which Homer recounts the Trojan War of the 13th or 12th century BC, also contains mentions of wrestling. 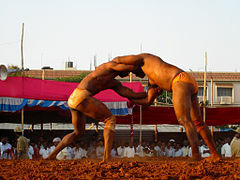 Indian epics Ramayana and Mahabharata contain references to martial arts including wrestling. In ancient Greece wrestling occupied a prominent place in legend and literature; wrestling competition, brutal in many aspects, served as the focal sport of the ancient Olympic Games. The ancient Romans borrowed heavily from Greek wrestling, but eliminated much of its brutality. Some of the earliest references to wrestling can be found in wrestling mythology. A Frenchman[n 1] "is generally credited with reorganizing European loose wrestling into a professional sport", Greco-Roman wrestling. This style which was finalized by the 19th century and by then, wrestling was featured in many fairs and festivals in Europe. UWW, then known as FILA, codified the form of beach wrestling in 2004. Beach wrestling is standing wrestling done by wrestlers, male or female, inside a sand-filled circle measuring 7 meters (23 ft) in diameter. 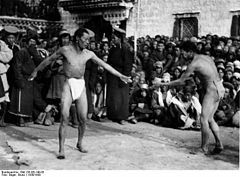 The style originally mirrored the rules used before the use of wrestling mats, and beach wrestling has been regarded as the oldest version of international competitive wrestling. The wrestlers wear swimsuits rather than special wrestling uniforms. Wrestlers may also wear spandex or athletic shorts. The international rules have been modified in 2015 by UWW, with the current rules allowing wrestlers to score points via takedowns, pushing their opponent out of bounds, or bringing the opponent down to their back. In addition to the annual World Beach Wrestling Championships, beach wrestling has been contested at Youth Olympic Games, Asian Games, Down Under Games, Mediterranean Games and expected to be contested at the upcoming 2019 World Beach Games. Collegiate wrestling (sometimes known as scholastic wrestling or folkstyle wrestling) is the commonly used name of wrestling practiced at the college and university level in the United States. This style, with modifications, is also practiced at the high school and middle school levels, and also for younger participants. The term is used to distinguish the style from other styles of wrestling used in other parts of the world, and from those of the Olympic Games: Greco-Roman wrestling, and Freestyle wrestling. Some high schools in the U.S. have developed junior varsity and freshman teams alongside varsity teams. Junior varsity and freshman wrestling teams restrict competitors not only by weight, but also by age and the amount of wrestling a competitor can partake in. For example, some junior varsity and freshman competitors are not allowed in tournament competition due to the amount of mat time a wrestler would accrue in a short time period. There are currently several organizations which oversee collegiate wrestling competition: Divisions I, II, and III of the NCAA, the NAIA, the NJCAA, and the NCWA. NCAA Division I wrestling is considered the most prestigious and challenging level of competition. A school chooses which athletic organization to join, although it may compete against teams from other levels and organizations during regular-season competition. The collegiate season starts in October or November and culminates with the NCAA tournament held in March. Sometimes referred as "American-Style" professional wrestling, companies such as WWE, Impact Wrestling and ROH run touring professional wrestling events throughout the world. Fights are highly theatrical, with dramatic stories such as feuds between fighters developed and performed as part of build-up and promotion for matches. Before its increase in popularity in the mid 1980s, professional wrestling in the United States was organised as a cartel of regional monopolies, known as "territories." 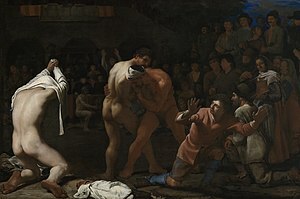 Wrestling in some of these areas (particularly the Southern and Midwestern United States) was performed in a relatively less theatrical more serious style, which could vary from realistically sporting to darkly violent, depending on local preference. A different style of professional wrestling evolved in the United Kingdom and spread across Western Europe (where it was known as "Catch" in the non English speaking countries of mainland Europe.) Traditionally in this style, there was less use of storylines and angles to promote the matches which, for the most part, had the atmosphere of real wrestling competition. In many countries such as the UK, this form of professional wrestling achieved mainstream popularity with television making household names of its stars, but later declined and was supplanted both on television and in wider culture by imported American wrestling. Some promoters in the UK (and to a lesser extent France and Germany) still produce live shows in this style but face stiff competition from more American-styled rivals. Japanese professional wrestling, also known as puroresu, is also treated more as a sport than the entertainment style of wrestling common in North America. As with British/European wrestling, there are fewer and less contrived storylines and angles and there is a similar atmosphere of realistic sporting competition. Techniques include use of amateur or shoot wrestling tactics in addition to hard hitting martial arts strikes and complex submission maneuvers. This means that the wrestlers are more prone to injury. Popular Japanese wrestlers include Rikidozan, Giant Baba, Antonio Inoki, Mitsuharu Misawa, Kenta Kobashi, Shinya Hashimoto and Keiji Mutoh. Mexican professional wrestling, also known as lucha libre, is a style of wrestling using special holds. Most performers, known as luchadores (singular luchador), begin their careers wearing masks, but most will lose their masks during their careers. Traditionally a match involves the best of three rounds, with no time limit. Each luchador uses his own special wrestling style or "estilo de lucha" consisting of aerial attack moves, strikes and complex submission holds. Popular luchadores in Mexico and Puerto Rico are El Santo, Blue Demon, Mil Máscaras, Perro Aguayo, Carlos Colón, Konnan, La Parka and Místico. Several wrestlers who performed in Mexico also had success in the United States, including Eddie Guerrero, Rey Mysterio (Jr.) and Dos Caras Jr./Alberto Del Rio. The Ancient Greek version of MMA was called the pankration. Similar to modern MMA it freely employed wrestling techniques. The rapid rise in the popularity of mixed martial arts (MMA) has increased interest in wrestling due to its effectiveness in the sport. It is considered one of three core disciplines in MMA together with kickboxing and Brazilian jiu-jitsu. Already in the early stages of MMA development, wrestling gained respect due to its effectiveness against traditional martial artists. Wrestlers, Dan Severn, Don Frye, Mark Coleman, Randy Couture and Mark Kerr went on to win early Ultimate Fighting Tournaments. Ken Shamrock won the first UFC Superfight Championship in the UFC and was also the first King of Pancrase in Japan. UFC color commentator Joe Rogan stated: “I personally think that the very best skill for MMA is wrestling, I think that’s the number one base to come from because those guys just flat out dictate where the fight takes place [standing or on the ground]." "There is no better base for entering into mixed martial arts than the highly successful competitor as a wrestler. The competitive wrestlers, the highly successful amateur wrestlers have such tremendous mental toughness. If you can just get through the room, the wrestling room practices at like really high level universities, NCAA division one teams; those guys are savages. The stuff they go through, just the overtraining, just the mental toughness that you have to develop." ^ OED; see also Dictionary.com. "Wrestle". dictionary.com. Retrieved 2007-10-08. ^ "The Historical origins of Wrestling". collegesportsscholarships.com. Retrieved 21 November 2010. ^ Salamone, Frank (2013). The Native American Identity in Sports. Rowman & Littlefield. p. 123. ISBN 9780810887084. ^ Miller, Christopher. "Submission Fighting and the Rules of Ancient Greek Wrestling". Retrieved 2007-10-08. ^ a b "Wrestling, Freestyle" by Michael B. Poliakoff from Encyclopedia of World Sport: From Ancient Times to the Present, Vol. 3, p. 1193, eds. David Levinson and Karen Christensen (Santa Barbara, CA: ABC-CLIO, Inc., 1996). ^ a b "Wrestling, Freestyle" by Michael B. Poliakoff from Encyclopedia of World Sport: From Ancient Times to the Present, Vol. 3, p. 1190, eds. David Levinson and Karen Christensen (Santa Barbara, CA: ABC-CLIO, Inc., 1996). ^ Encyclopædia Britannica, 1981, p. 1026. ^ International Federation of Associated Wrestling Styles. "Greco-Roman Wrestling". FILA. Archived from the original on 2011-07-11. Retrieved 2007-08-09. ^ "Wrestling, Greco-Roman" by Michael B. Poliakoff from Encyclopedia of World Sport: From Ancient Times to the Present, Vol. 3, p. 1194, eds. David Levinson and Karen Christensen (Santa Barbara, CA: ABC-CLIO, Inc., 1996). ^ Teet, Rob (2016-03-07). Hosting Beach Wrestling Events on Google Books. ISBN 9781329956216. Retrieved 14 December 2016. ^ "SandWrestling.com". Archived from the original on 23 October 2016. Retrieved 14 December 2016. ^ "Beach Wrestling Rules Adjusted". United World Wrestling. Retrieved 14 December 2016. ^ "UWW Disciplines". Retrieved 15 December 2016. ^ "Wrestling, Freestyle" by Michael B. Poliakoff from Encyclopedia of World the Sport: From Ancient Times to the Present, Vol. 3, p. 1192, eds. David Levinson and Karen Christensen (Santa Barbara, CA: ABC-CLIO, Inc., 1996). ^ International Federation of Associated Wrestling Styles. "Sambo". FILA. Retrieved 2007-08-09. ^ Wilson, Kevin. "Legends". Puroresu Central. Retrieved 2009-07-26. ^ "Can mixed martial arts save wrestling?". USATODAY.COM. ^ "Rogan: The very best skill for MMA is wrestling". The Underground. 19 May 2010. ^ "UFC® FIGHT PASS™ - Chael Sonnen vs. Nate Marquardt UFC 109". UFC.TV. ^ Coach Mike R (11 August 2013). "Factgrinder: The 25 Greatest Wrestlers in UFC History". Bloody Elbow. Look up Wrestling or Grappling in Wiktionary, the free dictionary.